On February 11, 2016, the LIGO Scientific Collaboration announced that they had made the first observation of gravitational waves. They were first predicted by Albert Einstein in 1916 on the basis of his theory of general relativity. Accelerating motion of masses like stars or black holes produces gravitational waves in the fabric of space-time, "distorting" and "bending" it. However, no matter how insignificant and small it is, even a flying mosquito continuously produces ripples in the spacetime throughout the entire cosmos, in the form of "gravitational radiation"
This infographic showcases the most important information about what gravitational waves really are, and how we can observe them. 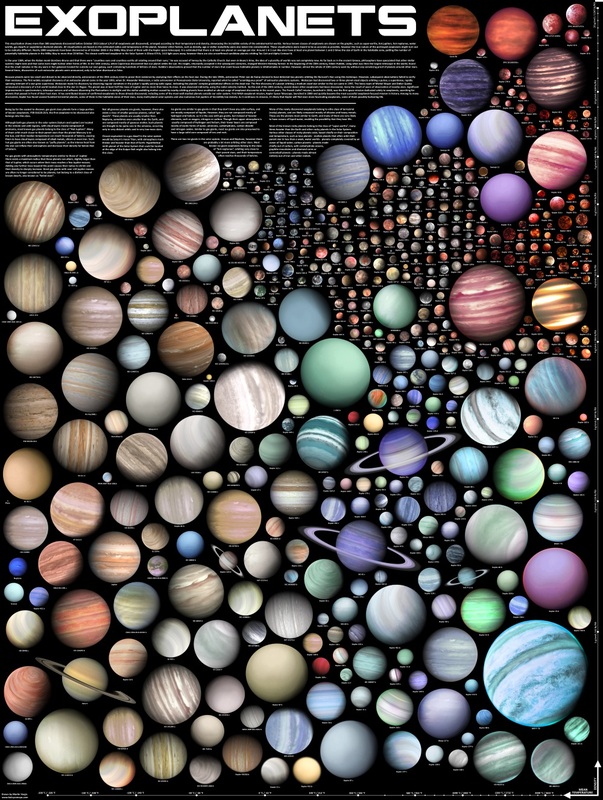 Various known classes of exoplanets are shown on the graphic, such as super-earths, hot jupiters, hot neptunes, water worlds, gas dwarfs or superdense diamond planets. All visualisations are based on the estimated radius and temperature of the planet, however other factors, such as density, age or stellar metallicity were also taken into consideration. These visualisations were meant to be as accurate as possible, however the true nature of the portrayed exoplanets might turn out to be radically different. 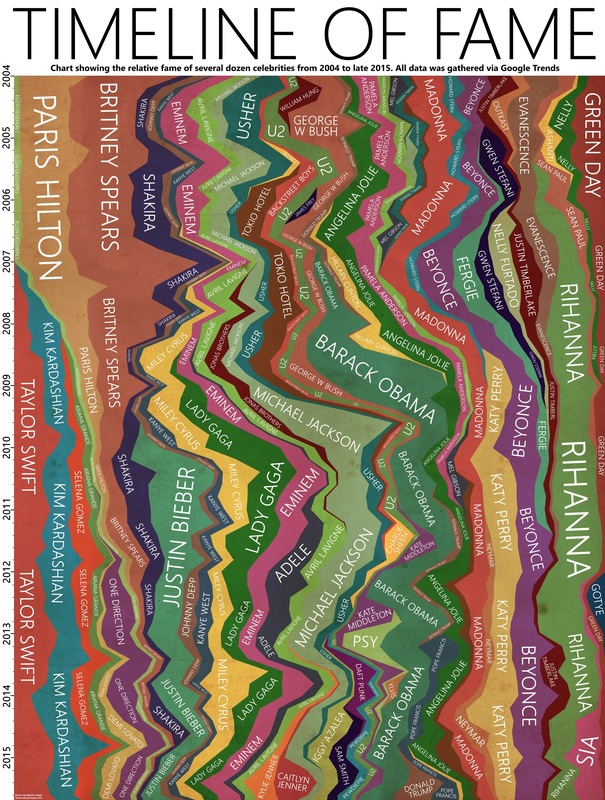 Chart showing the relative fame of the most famous people since 2004. All data was gathered from Google Trends, accurately showing the evolution of the public interest in various celebrities throughout the last 12 years. 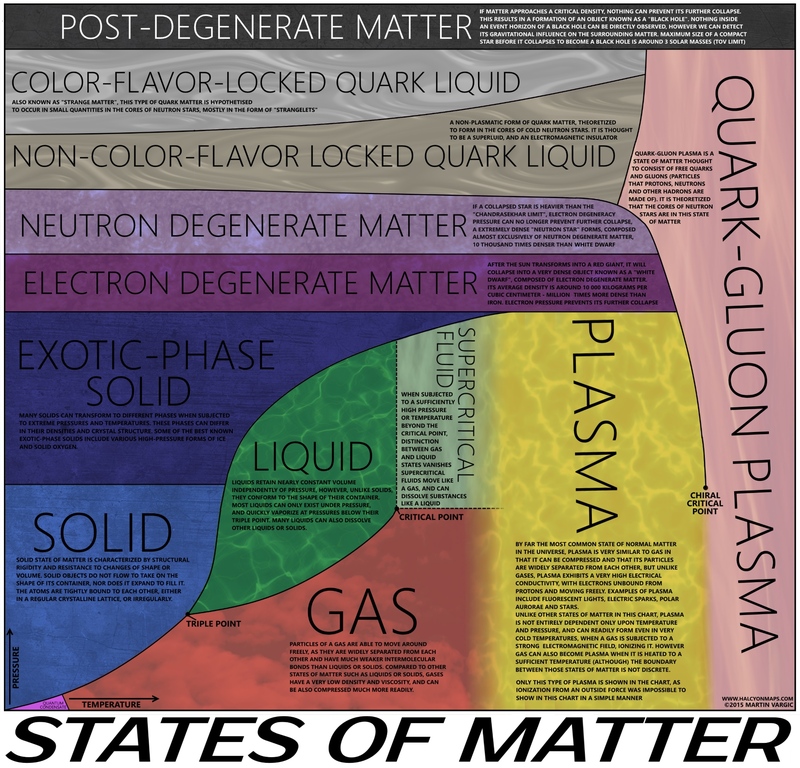 Chart showing the relations between the fundamental and more exotic states of matter, and how they change with temperature and pressure. Rich overview of the history and future of our universe, earth and nature, enabling anyone to explore the past and future of the world in a swift, clean and coherent fashion. Containing a comprehensive outline of the significant events in cosmic and natural history and future from the Big Bang to the heat death of the universe, with several hundred labels and a plethora of accompanying illustrations. A quick and entertaining way to learn about the history and the far future of the Universe and the solar system. Rich overview of the history and future of mankind, enabling anyone to explore the past and future of humanity in a swift, clean and coherent fashion. Containing a comprehensive outline of the significant events in human political, martial and scientific history and the future, from the origin of the human species to the year 100 000 AD. A quick and entertaining way to learn about the most important milestones in the history and future of the human race. Rich and comprehensive overview of the history of inventions, enabling anyone to explore the gradual progress of humanity throughout the history in a swift, clean and coherent fashion. Containing a comprehensive outline of the significant inventions of scientific, industrial, navigational or martial nature throughout the millenia, from the origin of the human species to the year 2015. Largest graphical scale of its kind, with several hundred labels and a plethora of accompanying illustrations. Rich visualization of speed, enabling anyone to swiftly explore and compare the speeds of different objects and entities. Containing a comprehensive outline of speed, including top speeds of various lifeforms, vehicles, planets, speeds of sound in various materials and much more. Comprehensive visualization of the scale of temperatures throughout our universe, enabling anyone to swiftly explore and compare the different temperatures from the coldest to the hottest. Containing a rich outline of temperature, including climate records, melting points of elements, temperatures of planets, stars and a lot more. All figures included in both Celsius and Fahrenheit scales. Rich visualization of the value of various materials and objects in the United States, enabling anyone to explore and compare the real values of things per unit of weight, from the cheapest to the most expensive, in a swift, clean and coherent fashion. Containing a outline of April 2015 values of various foods, liquids, metals, drugs and much, much more. All figures included in both USD/kg and USD/lb. Rich and comprehensive visualization of animal populations, enabling anyone to explore and compare the populations of different endangered and non-endangered species in a swift, clean and coherent fashion Includes the population sizes of various mammals, birds, reptiles, amphibians, fishes, crustaceans and a wide spectrum of other species. A quick and entertaining way to learn about the worldwide populations of various domestic and wild animals, and how they really compare to each other. Rich and comprehensive visualization of calorie contents of various foods, beverages and fuels, enabling anyone to explore and compare them in a swift, clean and coherent fashion. Containing a comprehensive graphical outline of calorie densities of a wide variety of different fruits, vegetables, cereals, meats, oils, beverages and even fuels. All figures included in both cal/100 g and cal/oz. Comprehensive visualization of the scale of matter density throughout our universe, enabling anyone to explore and compare the different densities from the lowest to the highest, in a swift, clean and coherent fashion. Containing a comprehensive outline of densities, including those of various gases, liquids, solids, and other exotic states of matter. All figures included in both kg/m3 and lb/ft3. Comprehensive visualization of the water depth, enabling anyone to explore and compare the depth of different water bodies, shipwrecks and various underwater phenomena in a swift, clean and coherent fashion. Containing a comprehensive outline of water depth, including the depths of various fish habitats, shipwrecks, pressures, lakes, oceans, depth ranges of various submersibles and much more. All figures included in both meters and feet. Comprehensive visualization of the scale of depth under the earth’s surface, enabling anyone to explore and compare the depth of different structures, landforms and phenomena, in a swift, clean and coherent fashion. Containing a comprehensive outline of depth, including the depths of various tunnels, caves, mineshafts, earthquake hypocenters and much, much more. Rich and comprehensive visualization of the deadliest diseases and disorders known to man, enabling anyone to explore and compare the maximum and average lifespans of different lifeforms in a swift, clean and coherent fashion. Includes the annual deaths from a wide variety of various bacterial, viral and parasitic infections, cancers, medical syndromes, birth defects and much more. A quick and entertaining way to learn about the scale of casualties from various diseases, and how they really compare to each other. Rich and comprehensive visualization of lethal doses of various substances, enabling anyone to explore and compare the strength and lethality of different toxins and chemicals in a swift, clean and coherent fashion. Includes the median lethal doses(ld50 )of various drugs, foods, animal venoms, natural toxins and much more. Rich overview of animal and plant lifespans, enabling anyone to explore and compare the maximum and average lifespans of different lifeforms in a swift, clean and coherent fashion. Containing a comprehensive outline of lifespans, from mayflies and bacteria to the very oldest organisms. Includes both average and maximum lifespans of various plants and animals. Rich overview of power, enabling anyone to explore and compare the power output of various objects and events in a swift, clean and coherent fashion. Containing a comprehensive graphical outline of power, including power outputs of various, vehicles, appliances. lifeforms, power plants, countries, stars and much more. A quick and entertaining way to learn about the range of power outputs of various objects and phenomenons, and how they really compare to each other. Visualization of the scale of pressure throughout our universe, enabling anyone to explore and compare the different pressures from the lowest to the highest, in a swift, clean and coherent fashion. Containing a comprehensive outline of pressure, including air pressures at various heights, pressure differences of sounds, tensile strenghts of a number of materials and much, much more. All figures included in both Pa(pascal) and psi(pounds per square inch). Rich and comprehensive visualization of the near space, enabling anyone to explore and compare the distances of various objects and phenomena from Earth in a swift, clean and coherent fashion. Containing a comprehensive outline of the distances of various satellites, asteroids, planets and other objects. All figures included in both km and miles. Collection of 6 detailed charts showing the sequence of the tallest buildings in every continent (Europe, Asia, North America, South America, Africa, Oceania) throughout the ancient and modern history. The chart shows the name and to-scale silhouette of each building, the years during which it was the continent’s tallest, and year of construction(unless it’s the same as the year when it became the world’s tallest). For comparison, numerous structures that are not actual buildings(pyramids, observation towers, monuments) were featured on the chart for their cultural significance, but were not counted as the “tallest building”. Red-tinted buildings on the charts have also held the record for the world’s tallest building at least once during their existence. All height figures represent pinnacle height, not roof height. Chart showing the tallest planned buildings in the world. The chart shows the name and to-scale silhouette of each building, the place where it has been proposed to be built and its height in meters and feet. Some of these buildings are still planned to be built in the future, but several had been cancelled for the lack of funding. All height figures represent pinnacle height, not roof height. Chart showing the overall prevalence of facial hair in various societies since the ancient era. All data was gathered from historical imagery. For every time period, the facial hair of prominent historical individuals and commoners on numerous visual depictions from various places has been noted and the final ratios beween the clean-shaven people and peopel with facial hair incorporated into the chart. “Ships throughout history” shows the evolution of ships and submarines from the ancient era to the present. It shows a large amount of famous and iconic vessels from every time period of the history and allows accurate size comparisons to be easily made. 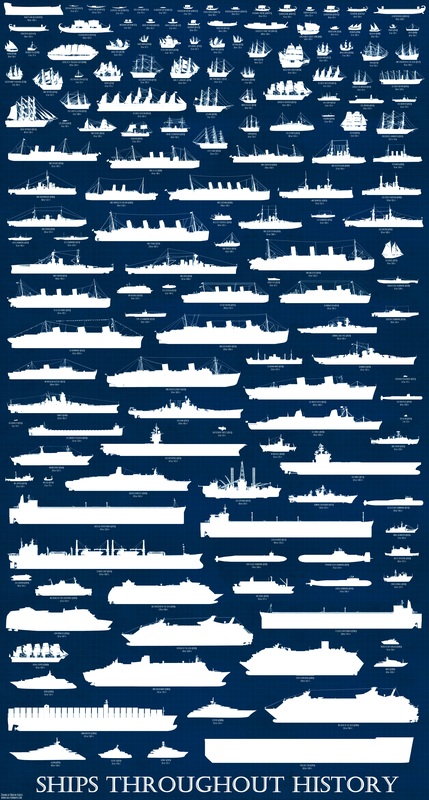 The entire infographic includes more than 175 ships, including the largest of every historical era, and displays their overall length in both feet and meters. All ship silhouettes are based either on historical photos and paintings or on historical textual evidence. Chart showing the deadliest earthquakes in the human history. Color gradient enables to easily distinguish events that took place in different eras. Chart showing the largest armies in various historical periods since 2500 BC, based on their estimated manpower. In order to compare different parts of the world, it is divided into “East” and “West” sections. Chart showing the deadliest battles in the human history, based on their death toll(injuries were not counted as casualties). Color gradient enables to easily distinguish battles that took place in different eras. Chart showing the deadliest wars in the human history, based on their death toll(injuries were not counted as casualties). Color gradient enables to easily distinguish wars that took place in different eras. Chart showing the highest-grossing films of all time(all movies grossing over $1 billion). All figures have been accurately calculated and adjusted for inflation, allowing comparisons between movies from different eras. Color gradient enables to easily distinguish movies from different decades. Gone With the Wind, a 1939 film directed by Victor Fleming, is almost universally considered to be the best-selling movie of all time adjusted for inflation, grossing more than 3.4 billion in 2015 US dollars. This visualization shows how the night sky could look like to a human observer if our Moon was replaced by some of the other planets and moons in the solar system, namely Vesta, Ceres, Pluto, Triton, Europa, Io, Callisto, Mercury, Titan, Ganymede, Mars, Venus, Earth, Neptune, Uranus, Saturn and Jupiter. All bodies on the graphic are to scale. HIGH QUALITY PRINTS AVAILABLE NOW! Though on the short timescale, stars appear to mantain nearly fixed positions in relation to each other, long-term observations show that all stars indeed move and all constellations gradually change over time. This chart shows how the various constellations and asterisms on the night sky(namely the Big Dipper, Orion, Crux, Leo, Cassiopea and Lyra) changed throughout the human history and how will they look to an earth-based observer in the distant future, due to the proper motion of stars in our galaxy. All data used to make this chart was gathered from the Hipparcos Catalogue, which was published in 1997 by the European Space Agency. It was a result of the 4-year long mission of the Hipparcos satellite. Visualization was achieved using the special astronomical software HippLiner. This visualization shows how the sunset could look like to a human observer if our Sun was replaced by some of the other stars in our galaxy with different sizes and magnitudes, namely Barnard’s Star, Gliese 581, Tau Ceti, Kepler-23, Alpha Centauri A, Procyon, Sirius, Pollux, Arcturus and Aldebaran. It is just a concept, as liquid water and the Earth as we know it could not exist in the vicinity of the most stars in this graphic. Visualizations are based on the absolute brightness, spectral class and the radius of each star.